Last edited by Checker on Wed Apr 04, 2018 2:07 pm, edited 70 times in total. This one can not be portable, in my opinion. It needs to modify the registry. Start-up tools, like Starter, Autoruns, and WhatInStartup. 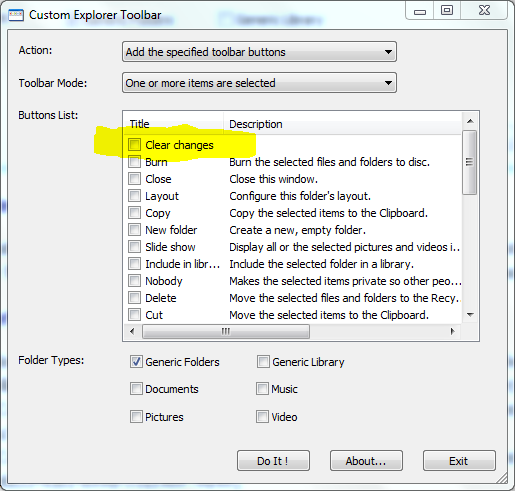 File type and context menu editors, like FastExplorer, OpenWithView, Types, XPAssociate, FileAsoc, and Gunners File Type Editor. General tweaking tools like XPredit, xp-config, regtickpro, and TweakUI. The changes made by these programs persist after they're terminated (unlike 7Plus, which I see that you suggested, and which tweaks Explorer only while it's running); however, the settings of the programs themselves are portable. I agree. Question is that where does the software store its own settings, plus is it able to restore the system's original state at close (optional). tproli wrote: ... is it able to restore the system's original state at close (optional). I thought it can't do that. But after I tried it myself, I saw it in options (the highlighted item - I guess it's for this purpose). However, you must do it manually, it's not an option "on close". Last edited by Checker on Wed Aug 10, 2011 11:41 pm, edited 1 time in total. OK, voted & I was about to add it I also tidied up the entry a little. guinness wrote: OK, voted & I was about to add it I also tidied up the entry a little. Maybe it's counting something, which still is in "Private"